A Kassam rocket fired into Israel by Gaza terrorists wounded a Bedouin woman in an open field near Ashkelon. A Kassam rocket launched by terrorists in Gaza struck an open field near Ashkelon wounding a bedouin woman in a nearby tent. The "Color Red" warning was sounded in several nearby communities. The woman, described as lightly wounded due to shrapnel in her legs, was treated by Magen David Adom medics before being evacuated to Barzilai Hospital in Ashkelon. The wounded woman is the wife of a shepherd from Be'er Sheva who tends his flock in the area several months per year with approval of the local regional council. Yair Farjoun, speaking on behalf of the Ashkelon regional council, said: "We have several dozen such encampments throughout the region. shepherds come for periods of six months. I've always said that open space is our livelihood and that we must not ignore what falls there." Farjoun said, "These are the fields, greenhouses and a Bedouin shepherd at work. The impact site was not far from the tent and only a by a miracle were casualties avoided . Tomorrow it could fall in a development. We must not give up, we rely on the IDF to know how to respond." 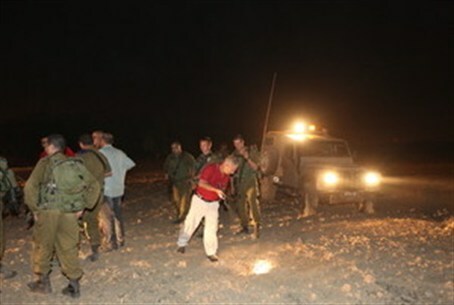 Earlier in the evening, a mortar shell fell in an open area near the western Negev. In this case there were no casualties or damage. Rocket and mortar attacks are on the rise again in the region as Fatah-Hamas unity talks have ground to a halt. Hamas had, briefly, sought to curtail such attacks after the unity agreement was first signed.